Mario, just wanted to say a big thank you for fixing the PDF issues I was having within emails and online. I had been putting up with the freezing problems for months. It was SO frustrating. Another mobile company attempted to fix it but you actually did fix it! So, just wanted to let you know that all is still going well and I can hardly believe that I do not have to put up with that problem anymore! Thank you. Were Eurobyte a public company I would be buying shares as I find Mario to be forthright in his advice and absolutely down to earth in his dealings with me as the client. He offers alternatives, if cost is likely to be a factor, and gives very common-sense reasons in support of his preferred option. In terms of date of birth I could be Mario's oldest client although I was introduced to him as recently as three or four years ago when my pride and joy, my second-hand (and first) computer died in harness, in spite of the best endeavours of friends, all enthusiastic amateurs, to keep it alive. My second second-hand computer also, after a time, appeared to be approaching death's door when a couple of more-realistic friends from Hunters Hill put me in touch with Mario. That was a great day !! My present "set-up" I bought through Mario and it works superbly (when I let it). Should problems arise that require the attention of the expert, Mario is available within a reasonable time ! He keeps his appointments, often to the minute; he gets on with the job (outlining what he is doing along the way) and he charges what can only be described as a very reasonable fee. Mario is an enthusiast in the best sense of the term, and he is also a very good teacher, whether he realizes it or not. I am glad he is "my I.T. man" and I wish Eurobyte every success in the future. From the fist telephone conversation with Mario he impressed me with his knowledge and his business type manner in appreciating how important it was to be online. Within 24 hours Mario had diagnosed the problem with my four year old laptop. As technology had progressed he also showed me some of his computers and I was impressed with what they could do and the time they could do it. Mario was conscious of the fact that I didn’t want to spend money however it was inevitable that I upgrade. His help in deciding which computer would best suit my use for money invested was much appreciated. The new computer I purchased through Mario has heaps of memory, power and accessories all at a very competitive price. I really appreciated Mario’s knowledge and help, as a previous technician told me that I should throw my laptop away, now I have a back up computer and I can also take it away with me when visiting clients and customers. As I have a boutique real estate practice and an international surfboard business it is imperative that I get fast and reliable service as I need to be online 24/7. 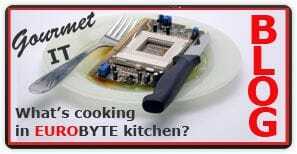 I cannot recommend Mario and Eurobyte highly enough. 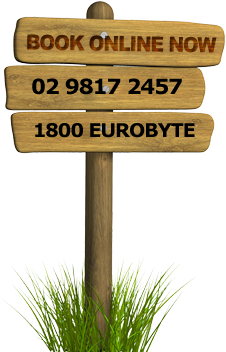 I have had an association with Eurobyte since 2004. The company came highly recommended by a doctor I knew. At the time our computer systems at work and at home were quite antiquated. In a very short time Mario had upgraded some computers, purchased at very good rates new computers and put in place a wireless network from out office to our home. Mario has been on call for us almost 24/7 ever since. My partner managed to delete most of his Outlook Express data completely last year. Within an hour Mario had found it and restored it to it’s rightful place. At first I kept Eurobyte as my secret but over the years I have recommended Mario to many business acquaintances as well as friends. All have reported their pleasure with his prompt service, his knowledge of computers and his buying power. Thank God for Mario and Eurobyte. No longer is it ‘panic stations’ when something goes wrong with my computer. I just say, “Mario will fix it’ and he does in record time and with patient explanations and suggestions for making my computer work more efficiently. I would recommend him to anyone who is experiencing any kind of computer problem.